…During the revolutionary war, the bell was secretly removed from Liberty Hall in PA and hidden away (under the floor boards of a church) until after the war. Learned that to move the bell in secret, it was hidden in a wooden wagon under a hoop skirt and hay so it was disguised like a pile of hay. 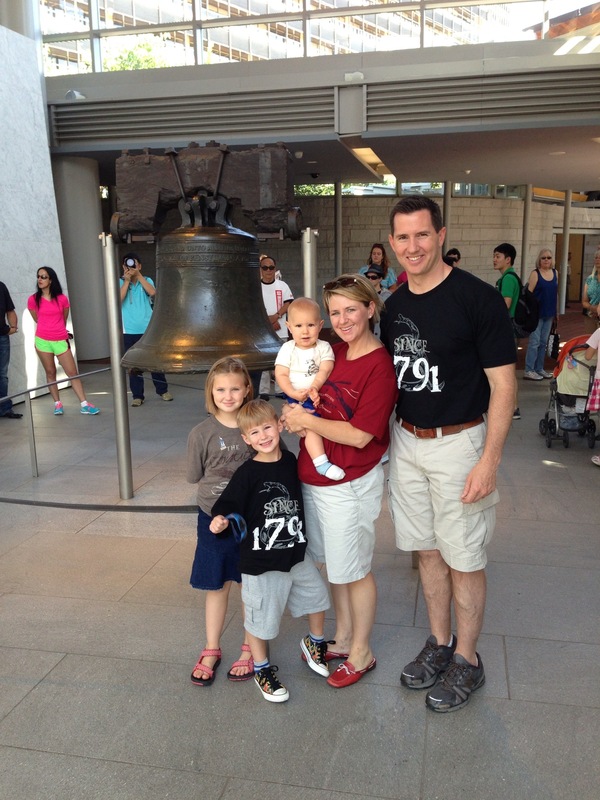 And Lastly, we learned that the Liberty Bell had its last clear note rung on February 23, 1846. It was rung to commemorate the birthday of George Washington. Because of our study, my children understood this was not just a bell…it was a symbol of determination by the people of America to preserve and protect their freedom. Our American brothers went to great lengths to hide it from the enemy and rang their bell proudly when the war was over. And through the stories and facts, my kids came to love this bell, this American symbol of freedom, of heart-pounding passion. Having read stories and learned all the facts, having seen pictures of it in books, and after driving almost 1,000 miles, we finally arrived at the Liberty Bell Center. We walked down the corridor towards the bell. Like waiting to see an old friend at the airport whom you haven’t seen in a long while, my children were eagerly anticipating their first encounter with “the bell.” I could tell their excitement mounted as they walked briskly to see this symbol in the “flesh”. And then…the waiting was over. There it was. Both of their paces slowed – almost to a stop. They were unaware of the people all around. My four year old son’s jaw dropped. My daughter just stared. Their eyes were fixed…it was real! That was it! It was really real! I don’t mean to sound corny or overly patriotic. This is exactly how it happened. And to be honest, I was amazed at how taken they were with this moment. As I stood behind them, watching them more than the bell, my eyes blurred. They were looking at the bell, but saw so much more! As a parent, this was a moment frozen in time. They had captured the spirit, felt (if even for a moment) the passion cast into this bell. As the privileged parent of these wonderful little people, their inspired moment has inspired me with further resolve to continue teaching them true American History. Just as we were clamoring for Patriots to fight the embolden British over 230 years ago, so today we search for modern day patriots to preserve the freedoms we hold today. How privileged I feel to have witnessed the birth of two more young patriots on this special day! Your description brought tears to my eyes! 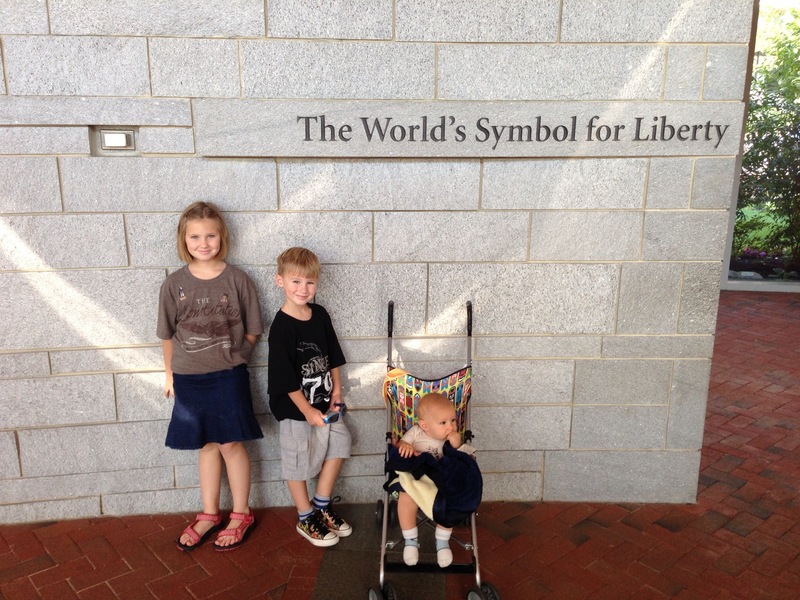 This is homeschooling….raising children….living…..at its finest! Thank you for taking the time to share and inspire! Katy you are truly a patriot! Teaching those lucky children not only the facts of history but the meaning, importance and the emotions. Thank you for being who you are.